We’re in Amboise in front of the Church of Saint Denis, waiting for our friends Susan and Simon from Days on the Claise. We’re here for a purpose. Susan wants to see some artworks in the church that she has heard about. It’s extremely cold so we go inside and wander around. It’s quite dark and gloomy and I don’t notice anything very interesting. Susan and Simon arrive with Antoinette from Chez Charnizay who is also interested in art. Our mutual friends Janet and Antoine who live in Amboise also join up with us. 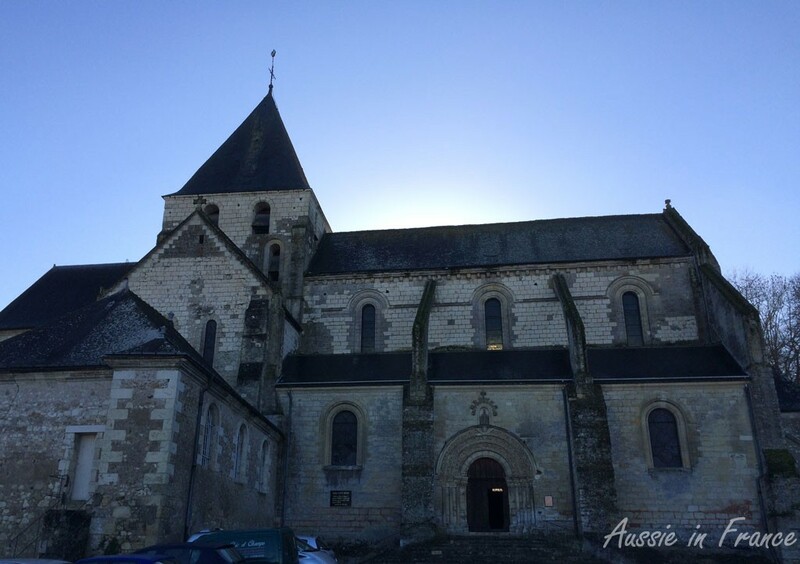 Susan takes us over the other side of the church in front of a group of statues called a Mise au tombeau which means emtombment and refers to the emtombment of Christ. I wonder why I didn’t notice it the first time. Susan and Antoinette start discussing the different people in the group. It was common practice for patrons of the art at the time – we’re talking about the 16th century here – to be depicted as historical and religious figures. A man called Philibert Babou, Treasurer to François I, commissioned the group of eight life-sized figures in painted limestone. It is believed that the figures are members of the Babou family. For people who know their religious history, the identity of the original characters should not pose a problem : Joseph of Arimathea, St Veronica, St John the Evangelist, the Virgin Mary, St Mary Magdelene, Mary of Clopas and Nicodemus. However, Susan is very curious about the fact that Mary Magdelene seems to be wearing a crown. Surely the Virgin Mary should be wearing it? 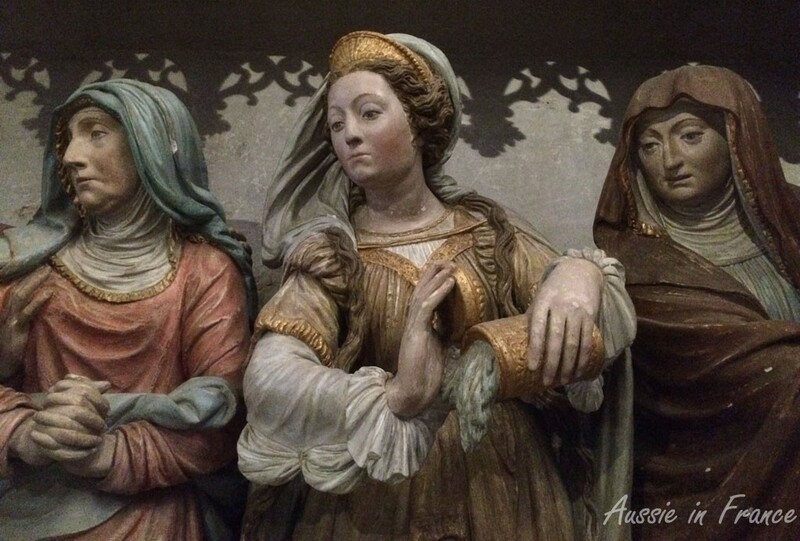 Mary is thought to be Marie Gaudin, Philibert’s wife, who would have been about 50 at the time and was considered in her youth to be one of the most beautiful women of her time. She even had an affair with François I some 30 years earlier. Antoinette also points out the clothes they are wearing, such as the ornate turban and flowing garments with their liberal gold trimming. Large amounts of fabric indicate greater wealth. The oriental look is typical of the sixteenth century. The headgear in general is very indicative of status. Mary Magdelene, who has the finest features and most intricate garments of the people depicted, is in fact wearing a gilded headdress and not a crown. Susan finally comes to the conclusion that “the message might be that anyone can come to God and it need not interfere with you looking gorgeous or showing off your assets”. I’m really enjoying myself. Having specialists to point out all these different aspects is far better than a guide book which I soon get bored with ! The two written guides we find in church are not very useful and don’t answer any of our questions. I’m also amazed that they were able to move it to Saint Denis intact from Montlouis further along the river. We take a closer look at the reclining figure on the right. It’s Mary Magdalen with a book in her hand and a box of perfume. 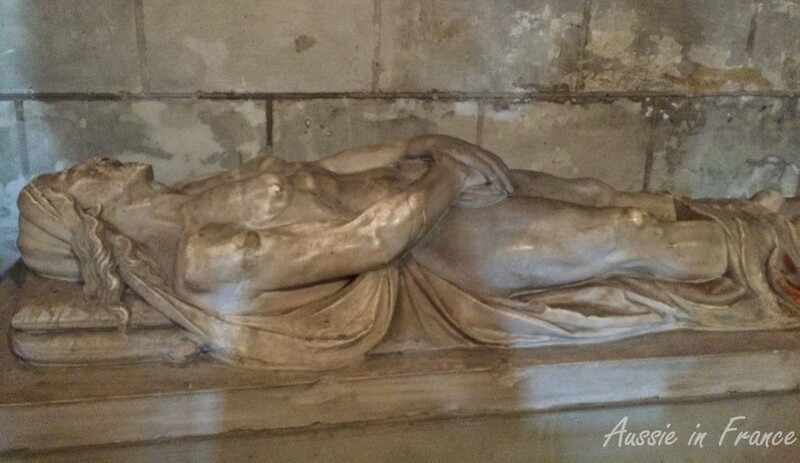 The sculpture was originally in a chapel in Amboise that has now disappeared. I’m surprised to see MM with a book but Susan tells me this is a typical way of depicting women in the 16th century. What really surprises me is there should still be so much mystery surrounding two artistic works of such calibre. Susan tells me it’s actually quite common and that, if nothing is known about a work of art, it is just ignored in the local guide books! 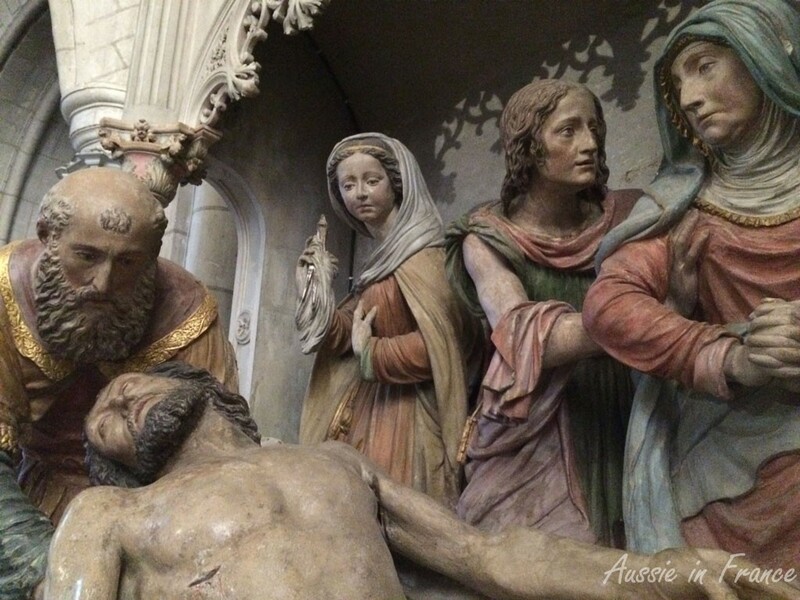 I go back to the Mise au Tombeau and look at more of the details which are quite amazing. Just the draperies could hold my interest for hours. Susan then calls smy attention to another work of art which is part of the altar piece – what can only be a representation of god which, as Susan points out, is most unusual. Only Christ and the Holy Spirit are usually depicted. She later discovers that it is, in fact, the Eternal Father, which corresponds to the first person of the Holy Trinity. 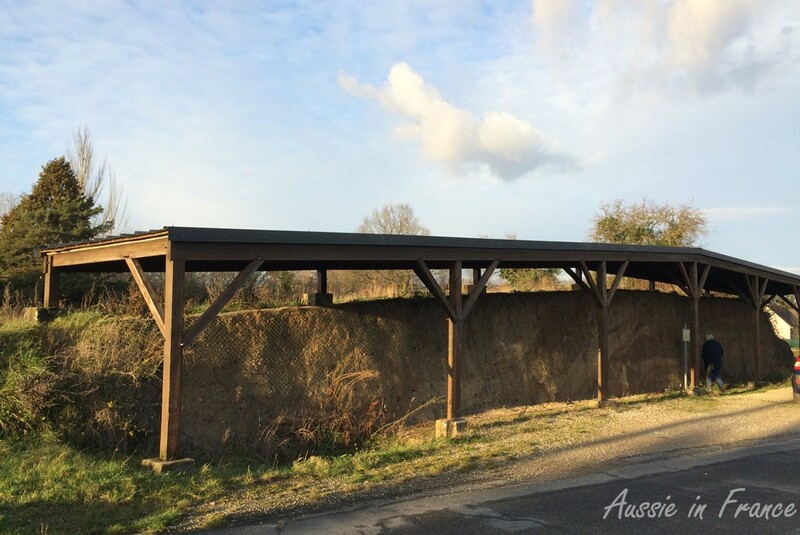 We end our wonderful afternoon a few kilometers outside Amboise at the Gaulish Oppidum where there is a mud rampart that dates from 400 to 50 BC and a mound called Caesar’s Hill overlooking the surrounding countryside. My only regret is that Susan and Simon live in the south of the Loire, an 90-minute drive from us! 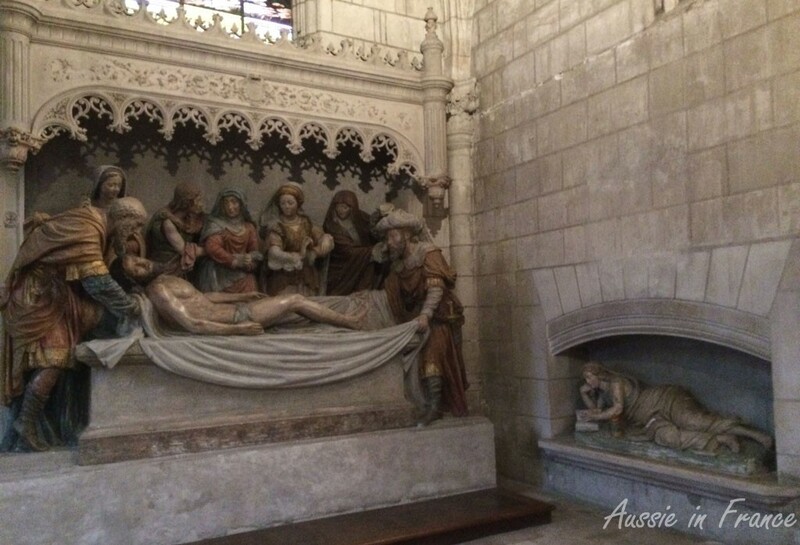 For more details about the Mise au Tombeau, I strongly recommend that you pop over to Susan’s blog Days on the Claise. She has written a very lively, yet very scholarly account in her usual inimitable fashion. 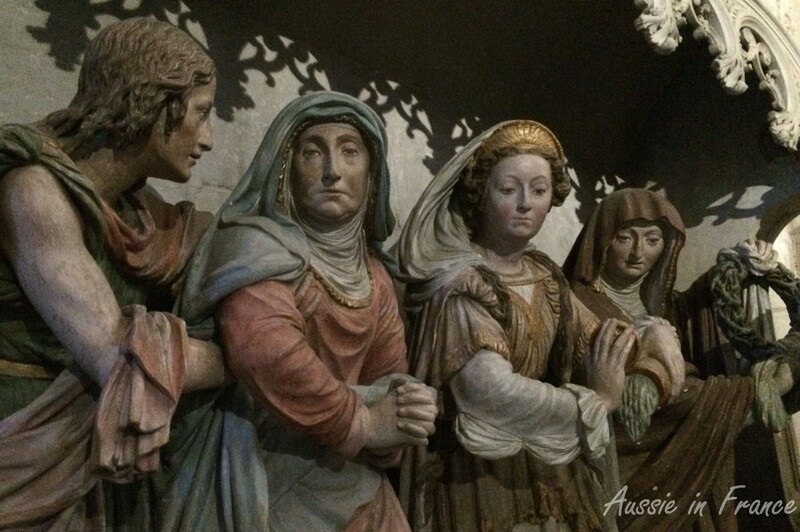 This entry was posted in Art, France, History, Loire Valley and tagged babou family, mise au tombeau saint denis amboise. Bookmark the permalink. 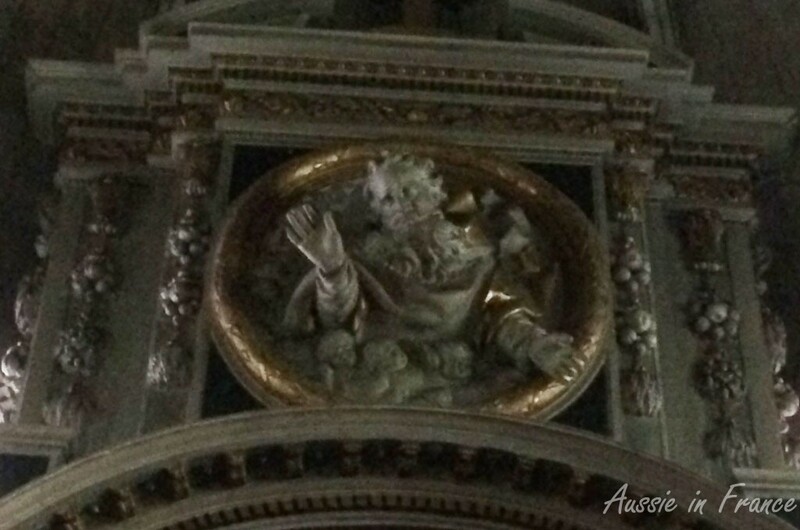 These are impressive works… I’ve not seen anything like it in a Catholic church here. That’s the problem when you live in a more recently built country! I’m so glad you enjoyed the visit. It’s a terrific church. By the way, I think it’s quite likely that the ‘drowned woman’ is Marie Gaudin. What I don’t believe is that the effigy is of a drowned woman. I think it is exactly contemporary with a similar effigy of Catherine de Medici in the Royal Mausoleum in the Basilica of Saint Denis, Paris. CdM rejected the first version of hers because it was too emaciated and gruesome, and I suspect a similar sentiment with this one in Amboise. 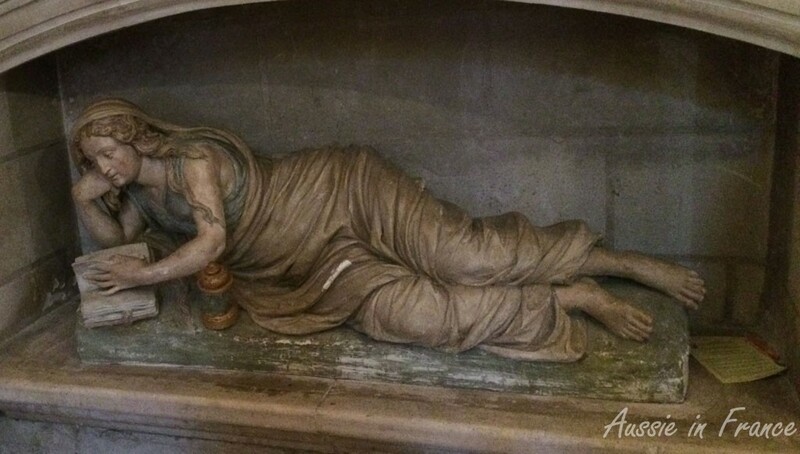 I’ve got posts coming up on the Mary Magdelene figure and the ‘drowned woman’ this week. 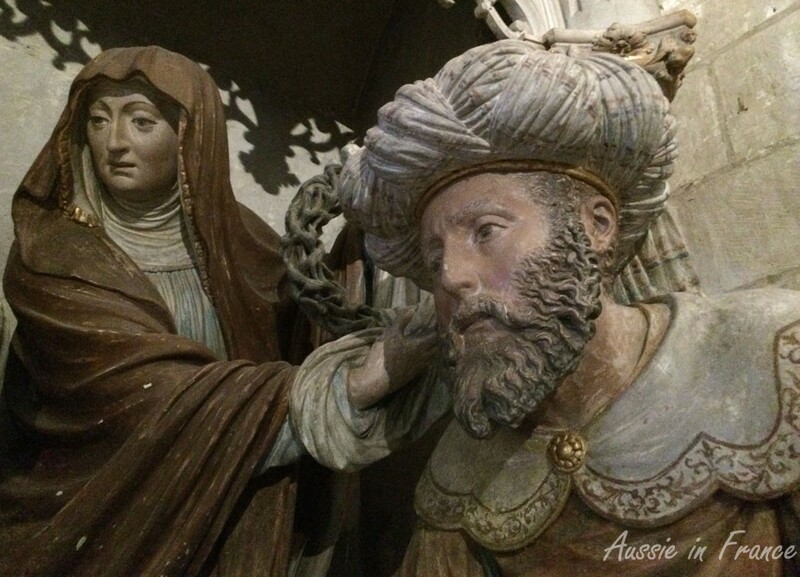 Many thanks for the link to my post on the Babou family mise au tombeau. You mean that Catherine de Medici was shown her emaciated gruesome drowned woman effigy? I’d hate that! CdM commissioned the work while she was still alive. Many aristocrats did. How wonderful to have such a well informed guide. On a ‘practical’ note, who would be responsible for the cleaning (week to week) and general upkeep of the statues? In terms of weekly cleaning the regular cleaner might be allowed to gently swish over them with a ‘feather’ duster style tool. They should not be allowed to wipe them in any way (although I suspect that wouldn’t stop some). The statues are the property of the State and will be inspected annual or as required by a curator or conservator from the Direction Régionale des Affaires Culturelles. Periodically they may be conservation cleaned (using a soft brush and a museum vac). I would recommend annually, but I suspect it doesn’t actually happen. Fancy there being such a thing as a museum vacuum! They are lightweight low suction machines that you can wear on your shoulder or back, leaving both hands free (one to direct the vacuum nozzle, one to use the brush). That was very interesting! One thing I was surprised at was that women in the 16th century knew how to read but I assume it is on the upper class women who could read? Also the mud rampart. How did it withstand the march of time, wood and mud???? Middle class and aristocratic mothers were expected to ensure their daughters could read, because of the widely disseminated tradition that Mary was taught to read by her mother Saint Anne. Sensible men ensured their daughters were educated sufficiently to manage the family estates because the men were so often absent. Reading for pleasure was also encouraged, due to the popularity of the chivalric romances, which were used at least partly for teaching practical morals (as opposed to piety) and civilised behaviour. Thank you, Susan, for that answer. I didn’t know about the tradition of Mary being taught to read by Anne. Jacqueline, I shall have to look into the question of how the rampart was so well preserved. Often these things got buried which preserved them. What a difference it makes to have the benefit of expert knowledge. I confess that as a philistine I’d have been bored stiff (and probably frozen too by the sound of it), just looking at statues and effigies. But once you know the story behind them, it becomes really fascinating. I absolutely agree. I’ve been reading the biography of Catarina Sforza in Romagna and can’t wait to go to Forli and see the places she lived in. It will make such a difference knowing the story – just like your Marie-Antoinette bicycle ride. It’s interesting that I can’t remember if we visited the Church of Saint Denis in Amboise. These are quite beautiful works of art, I probably wasn’t in this church since I can’t remember them. You have very good light in some of these pictures although it was dark in the church. Anda, you probably didn’t visit it as it is a bit out of the way. We had never seen it before. My iPhone does a surprising job sometimes when there isn’t much light but it doesn’t do well with distance, I’m afraid. I was sorry I didn’t take more photos of the drowned woman but there was a lot of light reflected on the marble and we all kept casting shadows on it. I’ll have to go back sometime!